No matter how smart, intelligent, and well-behaved your dog is, accidents happen. It can happen to the best of dogs. Accidents, and urine stains. They are not only unsightly, but also carry a smell that you just do not want in your apartment. Cleaning up after pets is a chore, and carpet flooring makes it even harder. What you have to do is invest in a best carpet cleaner for pets. Pet messes are usually easy to deal when they happen on hardwoods or tile. They are a whole new story. Regular cleaners might not do the work. Pet-designed cleaners penetrate deeply into the carpet to extract ground-in dirt, but also odors and stains. With that in mind, we will discuss what are the factors deciding the best carpet cleaner for pets ,prices, and how to use them. When you want to pick up a carpet cleaner for your dog, you need to look at several things. There are certain features that make a carpet cleaner better for handling pet stains. The first two things are enormous cleaning ability and ease of use. Yes, budget plays a role as well, but if you want to get the best cleaner, you should splurge a little. Capacity – How many dogs you have? The more dogs, the more hair you will have to deal. And also, consider the breed of your dog. Some dogs shed more, while others shed less. How often do you plan to clean the garbage bag? One of the biggest reasons why you need a carpet cleaner for pets is shedding. While shedding in cats can be controlled with frequent brushing and combing, dogs tend to shed more. Cats with healthy fur coats who are groomed regularly shed very little, almost none. Yes, there are hypoallergenic dog breeds, and they do not shed. But there is no such thing as 100% non-shedding dog breed. Dogs lose their old and damaged hair by shedding. And it is a normal process. The amount and frequency depend on the health of your dog and breed type. Some breeds shed more, some shed less. Also, dogs shed depending on the season. They develop thick coats in the winter, so that they can survive the lower temperatures, and shed that coat in the spring. There are mainly two types of carpet cleaning machines, no matter whether they are for pets or not. Those are full-sized cleaners, and compact cleaners. The full-sized cleaners are not ideal for those who are not quite as physically fit. They are harder to use, and cannot reach particularly tight places. Simply put, it doesn’t make sense to get a full-sized cleaner for a small apartment inhibited by a smaller person. 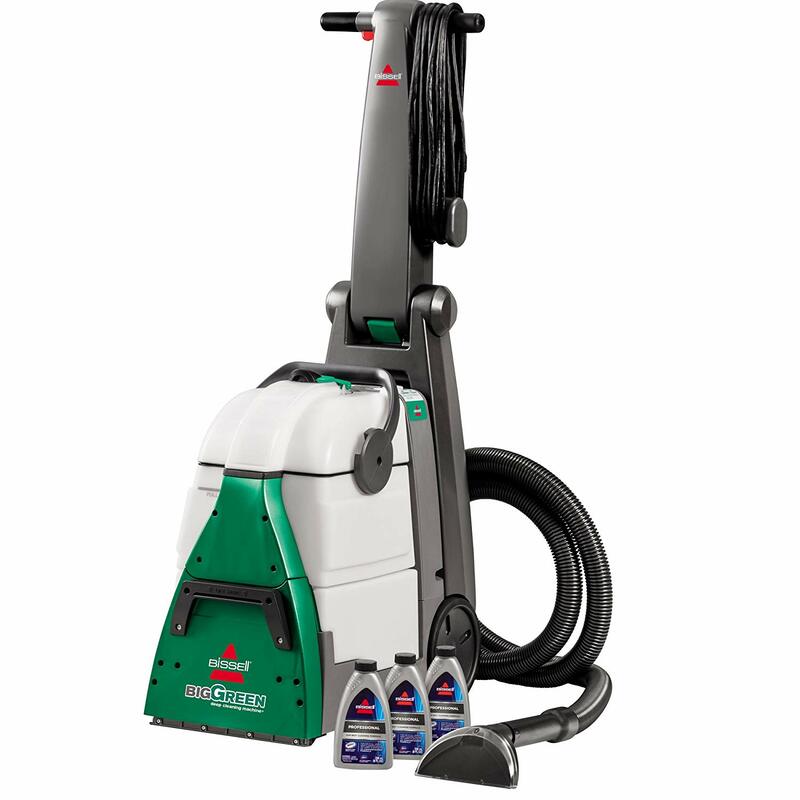 Compact cleaners do not have the same firepower, but they are easier to maneuver and are lighter in weight. What are the special features of pets carpet cleaners? We talked a little about cleaners in general, but what makes a cleaner a specialized one for pets? Well, it is all about the features. Before we get there, let’s just underline that a carpet cleaner is not a perfect solution for every pet-related problem. But there are a couple of features that make them good solutions. What are the benefits of carpet cleaners for pets? We talked about the factors determining what is a good carpet cleaner for pets, and now we will talk about the benefits. In other words, this is why you want a specifically designed cleaner for pets, not a regular vacuum cleaner. How to clean urine stains? No matter which carpet cleaner you choose, there is a right and a wrong way to clean stains. Dog urine can be problematic, and in some cases, if you do not notice it instantly, it can seep into carpeting and under flooring. The result is long-lasting odors. The key to cleaning urine stains is to follow the proper order of cleaning. First thing is to blot as much as possible without rubbing it into the carpeting. Spray with a pet targeted shampoo. Do not rub the shampoo as well. Now, get the carpet cleaning machine out. Do not overload the machine. Always follow the recommendations by the manufacturer for the right amount of detergent. Probably the best carpet cleaner for pets on the market. Not only it is labeled as “pet cleaner”, but it also does the job. The deep-clean mode of the cleaner goes much deeper than other cleaners on the market, and that is something you absolutely have to have with pets. You can expect cleaning as a massive commercial size machine. The beauty of the machine is there are several different modes, from deep cleaning to express mode. The latter is great for daily and weekly cleaning, just to maintain the clean environment. The deep cleaning system also includes 2-in-1 pet upholstery tool that removes hair, odors, and stains from upholstery. For mess spots, you get a built-in pretreater. And the best part is the removable cover over the brush head, which makes removing hairs as easy as possible. 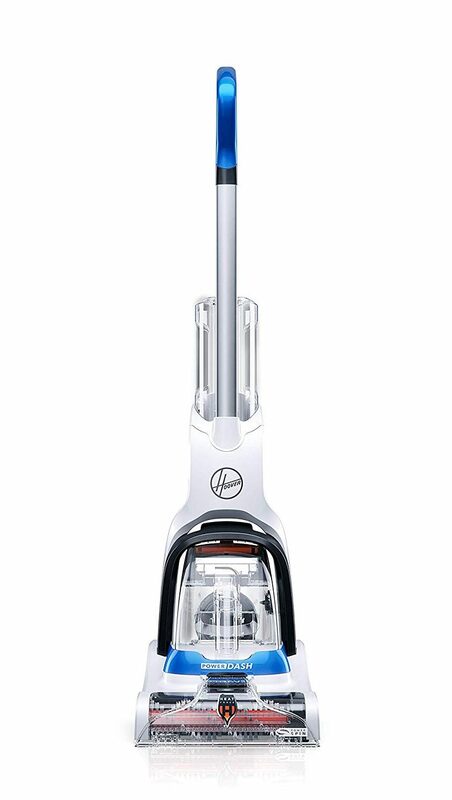 The capacity of this cleaner is smaller, but the weight is lighter. In other words, this is a budget-saving carpet cleaning machine from Hoover. The company has a couple of options, but we like this one as a budget-saving machine. It is great if you are looking to use it as an upright carpet cleaner machine for stains that don’t take up a lot of space. The machine uses the HeatForce technology, a unique feature of the Hoover cleaners. Thanks to the technology, it dries up your carpet much faster. If you want, you can buy the carpet cleaner solution in a bundle set. 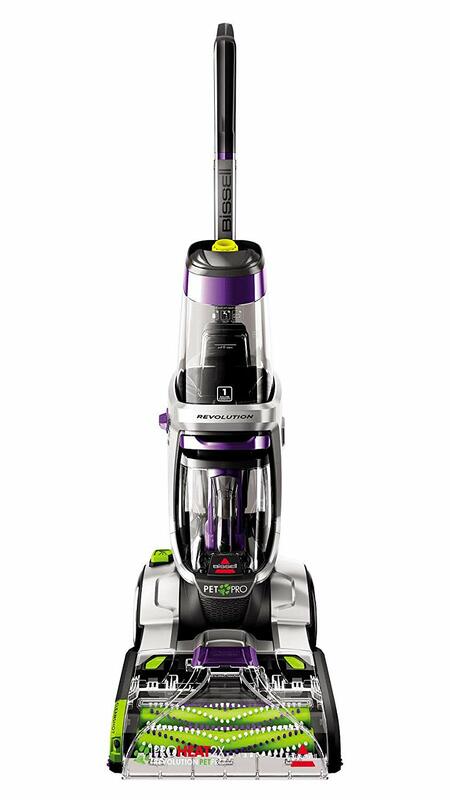 And while it is a lightweight carpet cleaner, it packs two times more cleaning power than a traditional lightweight cleaner. If you can afford to spend a little bit more, Hoover also has a powerful full-sized carpet cleaner. It is a bit more expensive than the Power Dash, but it is on the level of Bissell’s cleaner. It even has some unique features that the Bissell does not provide, like the trademark HeatForce technology. 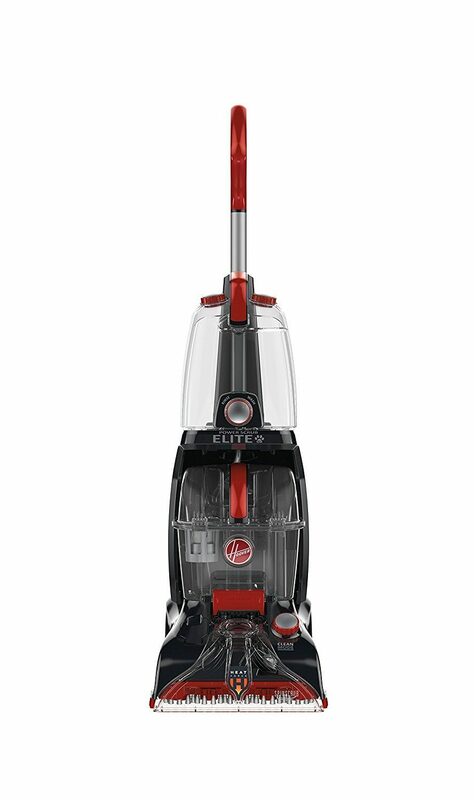 The Power Scrub Elite is a popular alternative to the Bissell. It also has a quick cleaning mode, but comes with a special antimicrobial tool to the brush attachment. Another difference is that when you add attachments to the main unit, you can turn the main unit off. This is something that is not possible on the Bissell. The set of features is a bit different, and it really comes down to preference. Some people choose the Bissell, others go for the Hoover. In any case, these two are rightfully considered the best two options for a carpet cleaner for pets. Consumers swear by this portable spot cleaner. Rug Doctor is not something you get for cleaning your entire house or room, for that matter. It is more of a spot cleaning machine. 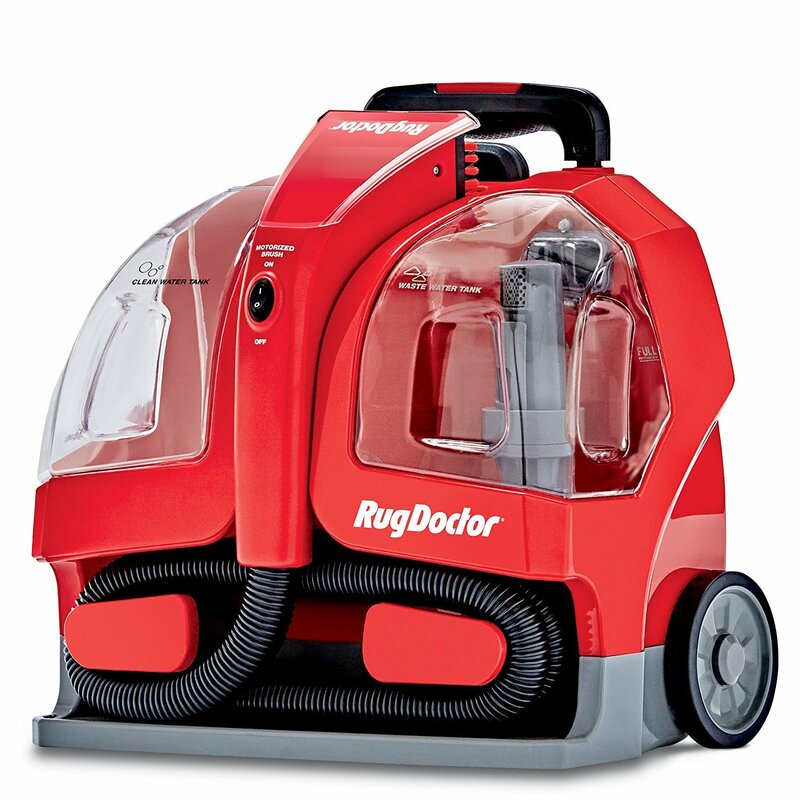 You get a huge range for cleaning as the handle is retractable and the nose is more than 5 feet long. The cleaner was designed to reach spots that the classic full-size carpet cleaner does not reach. It can penetrate deeply into each carpet fiber and break down spots confidently, leaving no dirt or stains behind. Chances are, you might not need this carpet cleaner. Why? Because it is designed for commercial users, not home users. But if you have a huge dog stain and dog hair problem, you have to invest in something that takes care of business. And that is the Professional Carpet Cleaner Machine by Bissell. This machine comes with not one, but two large tanks for full-room cleaning. The heavy-duty suction power aids in fast drying time, and cleans on the forward and backward pass. This feature reduces cleaning time and dries faster than competitive cleaners. And it comes with all of the nifty features of the Bissell Pro Heat Pet Cleaner.